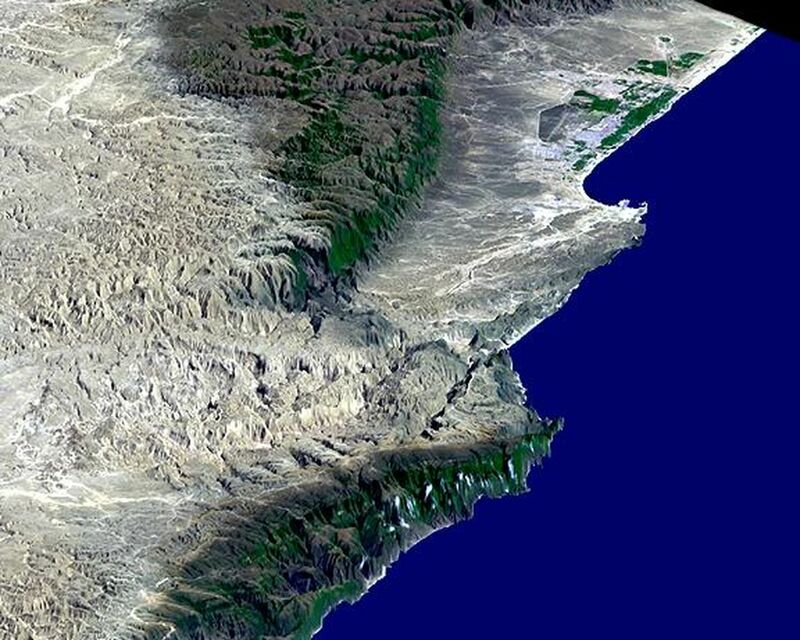 This perspective view includes the city of Salalah, the second largest city in Oman. The city is located on the broad, generally bright coastal plain and includes areas of green irrigated crops. 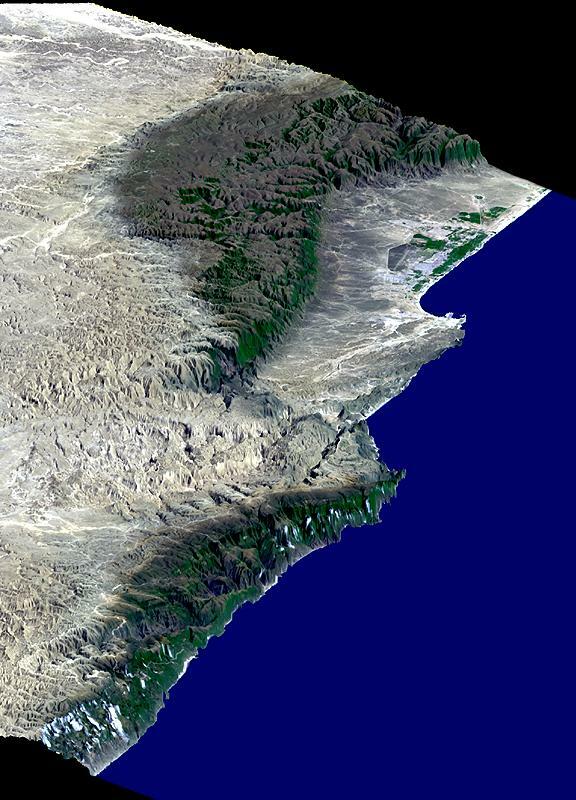 This view was generated from a Landsat image draped over a preliminary elevation model produced by the Shuttle Radar Topography Mission (SRTM). The edges of the dataset are to the upper right, left, and lower left. The Arabian Sea (lower right) is represented by the blue false-colored area. Vertical exaggeration of topography is 3X. This scene illustrates how topography determines local climate and, in turn, where people live. The Arabian Peninsula is very arid. 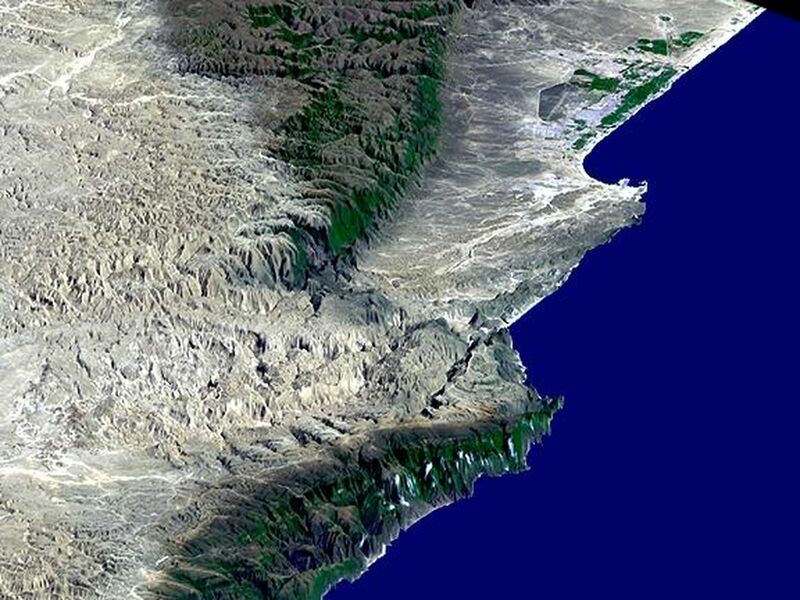 However, the steep escarpment of the Qara Mountains wrings moisture from the summer monsoons allowing for growth of natural vegetation (green along the mountain fronts and in the canyons), and soil development (dark brown areas), as well as cultural development of the coastal plain. The monsoons also provide moisture for Frankincense trees growing on the desert (north) side of the mountains. In ancient times, incense derived from the sap of the Frankincense tree was the basis for an extremely lucrative trade. 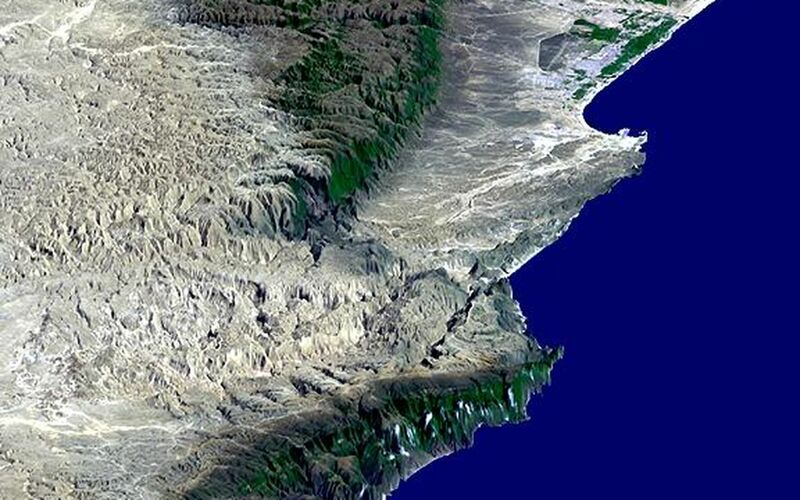 Elevation data used in this image was acquired by SRTM aboard the Space Shuttle Endeavour, launched on February 11, 2000. SRTM used the same radar instrument that comprised the Spaceborne Imaging Radar-C/X-Band Synthetic Aperture Radar (SIR-C/X-SAR) that flew twice on the Space Shuttle Endeavour in 1994. SRTM was designed to collect three-dimensional measurements of the Earth's surface. To collect the 3-D data, engineers added a 60-meter-long (200-foot) mast, installed additional C-band and X-band antennas, and improved tracking and navigation devices. The mission is a cooperative project between the National Aeronautics and Space Administration (NASA), the National Imagery and Mapping Agency (NIMA) of the U.S. Department of Defense (DoD), and the German and Italian space agencies. It is managed by NASA's Jet Propulsion Laboratory, Pasadena, CA, for NASA's Earth Science Enterprise, Washington, DC. Location: 17 deg. North lat., 54 deg. East lon.